The following is a guest post by Daniel Stern. Daniel shared with me a tool he created called range.css, which is for styling <input type="range">. This is one of those tricky things, because it requires a weird mix of normal standardized selectors and properties and non-standard and prefixed selectors and properties. I invited Daniel to explain all that. Range input with completely custom styles. In order to simplify the process of generating cross-compatible styles, LESS style sheets have been included. CSS is also available. Several styles need to be applied to range inputs in all browsers to override their basic appearance. This gives us invisible or unstyled range inputs in all browsers. Now we can apply our custom styles. The widget that you click or drag along the track is called the thumb. It can be styled just like a regular HTML element. Note that while we're repeating code here, that's necessary as you can't comma-separate these type of selectors. Browsers will drop the entire selector if it doesn't understand a part of it. The line that the thumb moves across is called the track. It is also styled just like a regular HTML element. A note on IE: Internet Explorer 10+ has a slightly different approach to range inputs. In IE, you are allowed to specify completely different styles for the upper (right of the thumb) and lower (left of the thumb) areas of the track. Another thing to note is that you can apply focus effects to the track which change the styling when the user is interacting with the range. Now that we've built a thumb and a track, we can combine the CSS together and make the completed range input. The full CSS for the styled range inputs in all browsers is below. 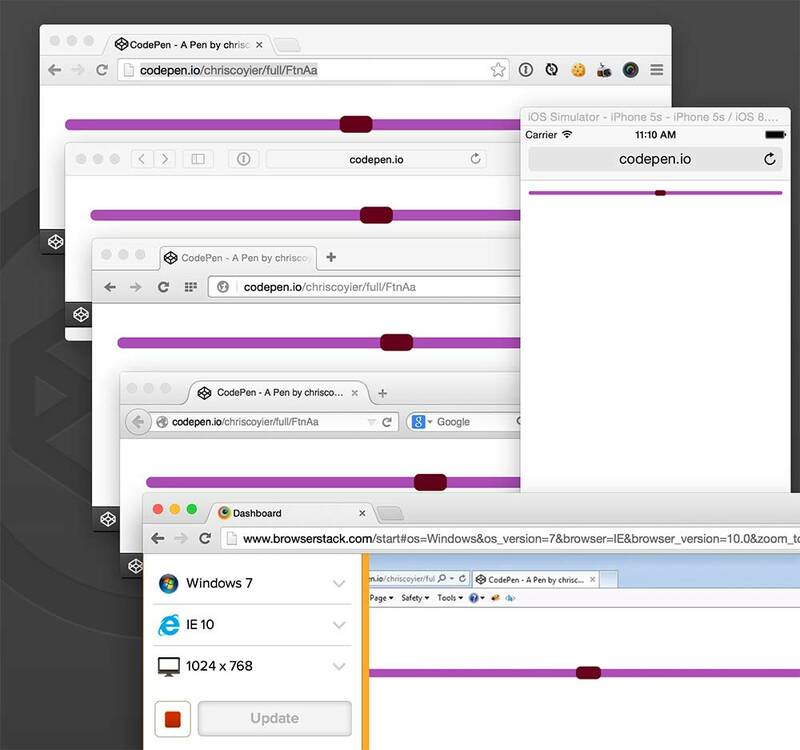 There is a lot of CSS required to make identical range inputs for each browser. Using a preprocessor, you can achieve much more efficient results. Included below is the LESS file use to generate the CSS above. Darlan Rod created a Sass version as well. The range input itself has browser support about like: Firefox 23+, Safari 4+, iOS 5+, Chrome 6+, Opera 11+, IE 10+, Android 4.2+. So pretty good. This custom styling stuff should largely match that if you follow the code in this article. See the Pen FtnAa by Chris Coyier (@chriscoyier) on CodePen. If a browser doesn't support range inputs, you'll just get a text input, which is still functional and valid. As cross-browser range input styles only became viable in 2014, there are not many tools yet to generate modern styles. range.css is a useful tool for generating CSS styles for range inputs that I created. You should definitely check out Ana Tudor's collection of highly stylized range inputs. This is good. Now if only people would make selects styleable we’ll be in good shape. Are referring to Firefox and the non-removable drop-down arrow? Otherwise they are able to be styled. I think @ElijahFowler is talking about creating a pseudo-element selector to style the select button directly like an input button. Something like select::arrow-button. This is not full example, but only the base. Is there any way to make the slider vertical while keeping the custom styling? How about combining a range slider with a progress bar? As a fresher new to designing I need to be get updated with so many things like this. Thanks a lot for letting me know this. Let me work on it. We can use the same technique as for when we do custom radio/checkboxes, by using the label as the acting button. And what is the point, a native slider might look a bit different on different platforms but at least (should) work for all and well. I’d always stick to built in solutions which also improve if the browsers improve. I am facing compatability issue in IE browser..What exact the prob i am stating …in our application home page which is topcatagory display page have one back ground image at left side and we have 4 content spots(text content) as well…Generally these content spots are like alerts every day ..if we apply all content spots (text content) the image is looking fine in IE and fire fox browser.In this case image size is increasing proposhinate to the text..when we remove 2 text content that back ground image is lacking some part of image on IE and fire fox..when we removed all the contents on the page even the image in going up only visable half of the image.More over this image is lacking much on IE browser for fire fox i have set min-height prop for back ground but the same is not reflecting in IE..any one could help on this ..Your quick reply would be highly appreciated.thanks in advance. even i have tried to removed and add min-height in my code with the same reflecting on fire fox and able to see the image properly but not in IE10 and IE8 ..Could you please help how would i apply the same for IE browser…Thank you. Awesome, thanks for this helpful share. Its very important to cross browser check even after these changes are made. Luckily, I haven’t had many problems with IE lately which is very nice, they are either doing a better job with updating or my css is more compatible!